You must need the best mountain bike you can afford but not sure where to start. 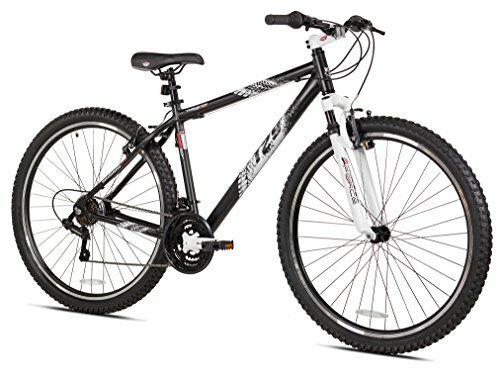 Where can you find a mens mountain bike review that you can trust? This Kent Thruster t29 review will hopefully get you started on your search. 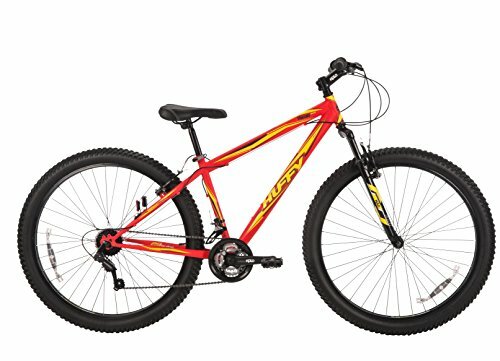 This is one of the best mountain bikes in the price range. You won't need to look much further to find a mountain bike that will have you on the road quickly and will make your trip worth all the time you've had to wait. The lightweight aluminum frame and alloy rims allow you to get speed from the Kent Thruster t29 while still being able to handle it. The heat-treated frame makes it tough enough to withstand the bumps and obstacles you find on the out-of-way trails you want to explore. The rims are tough enough not to bend or break at the slightest jolt. You'll find yourself able to navigate over small stones and sticks and never miss a beat. After all, you don't want to have to slow down every time you reach an obstacle. This mountain bike starts out with a lightweight, heat-treated aluminum frame that is created to withstand the toughest rides. Next, the manufacturer has added Shimano RS25 Shifters and TZ31 Derailleurs to help with smooth navigation. The alloy rims hold 29 x 2.1-inch tires. The tires are created with a knobby thread in order to traverse nearly any kind of terrain you might encounter. When it arrives, you only need to install the seat, pedals, and handlebars (all included) and you are ready to hit the road. The Kent Thruster t29 is loaded with features that are designed to give riders an individualized experience. The wide variety of speeds allow you to move from the flat pavement as you cross town onto the berm of the highway. You can then move onto dirt trails and navigate sharp inclines and declines without missing a beat. Wherever your adventure takes you, you know your bike can handle it. The Kent Thruster t29 is a hardtail, meaning it has front suspension. This allows for a smoother transition from pavement to trail. The front suspension also allows for easier climbing on inclines and the bike itself is lighter than with dual suspension, making it easier to handle. 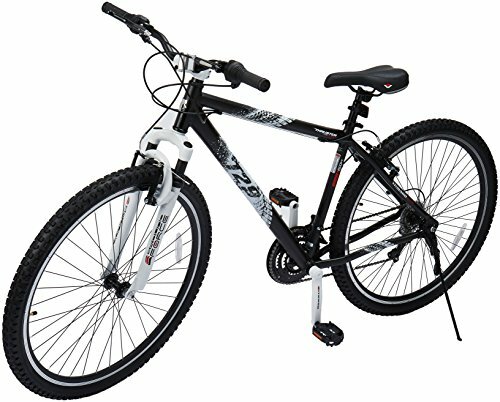 The 18-inch frame of this men's mountain bike has a thirty-inch stand over and is easily ridden by those between the heights of 5'6" and 6 feet tall. This means that it can accommodate most riders comfortably. For men who are on the lower end of this height range, it is especially welcome because few men's mountain bikes are designed to accommodate shorter legs. The double rims are created for a smooth rotation. The tires are 29-inches and a full 2.1-inches wide. The knobby tread makes for excellent gripping ability, making rides on wet or muddy surfaces safer. The larger tires make for easier handling and the width makes navigating over debris such as stones and small sticks easier. The tires and suspension make it versatile enough to ride on city streets or mountain trails. Riders of varying heights feel comfortable and the weight limit is on the upper end at 260 pounds. Frame is strong enough to be comparable to higher price range bike. Bikers in the higher weight range need the seat to be replaced as they find it a bit uncomfortable. The handlebar height is not adjustable, very tall bikers have to lean forward a bit more. Doesn't have disc brakes like most of the newer models. What is the weight limit on this bike? The weight limit of rider and any gear is 320 pounds. How are the gears shifted? This bike has twist shifters. Can a bike engine be strapped onto this bike? Yes, the frame is sturdy enough for this. The parts can be found easily at your local bike shop. No. The size and weight, which is 44 pounds, makes it difficult to handle during a jump. This is strictly a trail bike. The Kent Thruster T-29 Mens Mountain Bike Review showed this to be one of the best mountain bikes available in the price range. 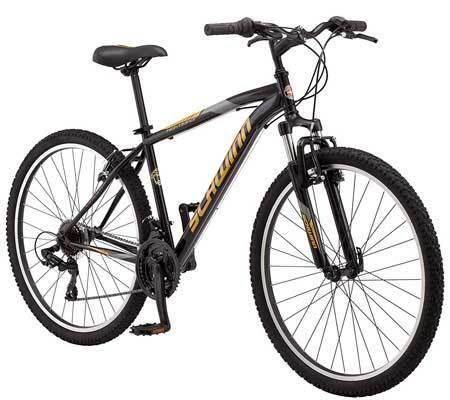 It is one of the few mountain bikes that can accommodate riders that are large as well as small. The large tires make it easy to handle whether you choose to ride on concrete or dirt trails. The tread on the tires makes it easy to find a grip on wet or muddy surfaces, allowing for a safe ride. Let's Start Mountain Biking Now! If you are looking for a mountain bike that will help you realize your dreams of a road trip that takes you across country or an everyday bike to help you get around town, you have found it in the Kent Thruster t29. Check it out today.